Fall is upon us and although we can’t get enough of the leaves changing color to gorgeous golden hues, we just had to share a bit of spring with you for this week’s Coast Diamond Engagement Ring of the Week. Trendvision Jewellery announced their Trendbook 2016 last week and listed this fabulous Coast Diamond engagement ring (pictured above) from our Flora Collection as a “must have” ring for brides-to-be! The ring features a brilliant round diamond surrounded by sparkling prong-set diamonds in delicate petals of white gold or platinum. Don’t you love the airiness of this engagement ring in bloom, a unique alternative to the traditional halo diamond engagement ring? Search now for these and other unique diamond engagement rings with a floral motif at Coast Diamond or an authorized Coast Diamond retailer near you. It’s official! 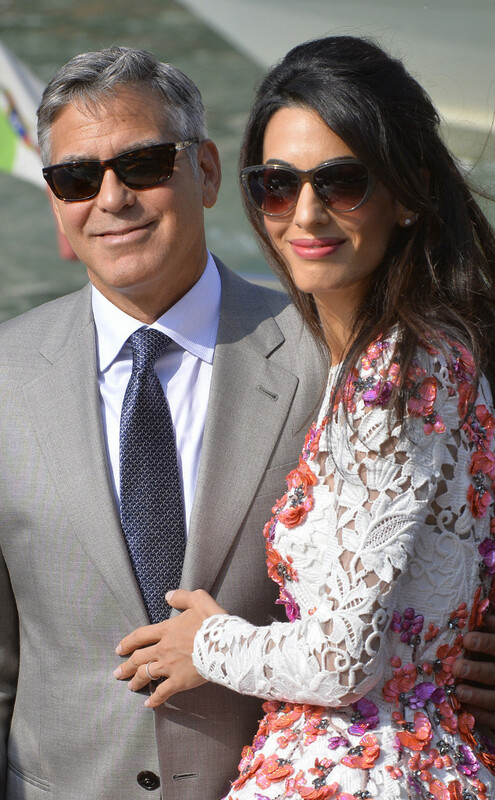 The world’s most famous bachelor, George Clooney, tied-the-knot in uber-romantic Venice, Italy, to human rights lawyer Amal Alamuddin this past weekend. We love the simple and elegant wedding rings: Amal’s brilliant eternity band of diamonds set in platinum and George’s platinum band. According to E! Online, guests at the Aman Canal Grande Hotel included Cindy Crawford and husband Randy Gerber, Bono, Bill Murray, Matt Damon and Vogue Editor-in-Chief Anna Wintour. Designer-style was at the forefront of this celebrity affair, with the beautiful bride wearing four dresses throughout the weekend, including the lace long-sleeved Giambattista Valli mini-dress with colorful flowers dotting the bodice and skirt. Truly You Events, owned by Philadelphia wedding planner Christiane Lehman, is a boutique wedding planning firm specializing in personalized, beautiful weddings in the Philadelphia region. Every couple has priorities and dreams for their wedding day. Whether you love the idea of a romantic candlelit reception in a Center City ballroom, or an endless cocktail party under the stars, Truly You Events has the experience and resources necessary to bring your individual wedding vision to life. If you’re in the Philadelphia area, be sure to contact Truly You Events for help planning your dream wedding. 1) Set up a hay ride out in the country at a pumpkin patch. Find a picture-perfect spot and drop to bended knee with the Coast Diamond rose gold halo diamond engagement ring ready to slip on her finger. 2) What is lovelier than a drive to look at majestic trees changing color? Rent a convertible, stop at Starbucks for two Pumpkin Spiced Lattes and head for the hills. As soon as you spot an idyllic stream with the golden leaves as a backdrop, ask the one you can’t live without to be yours forever. The perfect symbol of your commitment? May we suggest this Coast Diamond 1.56 carat padparadscha sapphire, the centerpiece of this beautiful platinum and diamond ring? 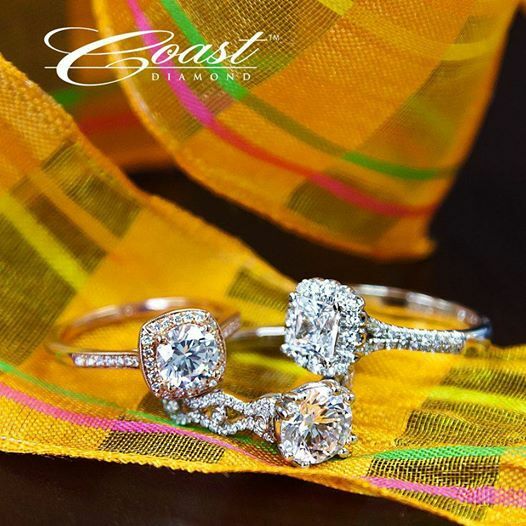 Whatever proposal you have planned, Coast Diamond has the perfect engagement ring. 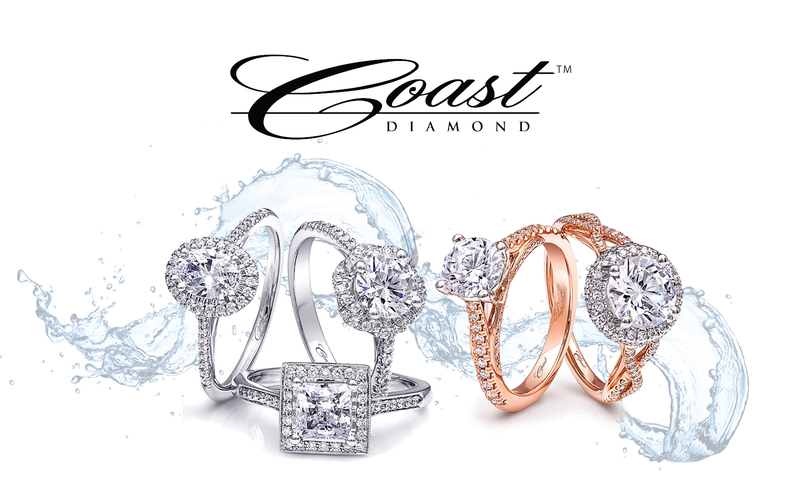 Click here to find an authorized Coast Diamond retailer near you. 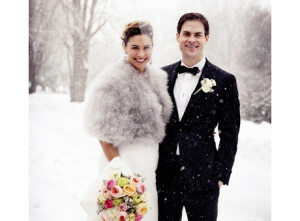 BRIDES magazine has celebrated all things bridal for the last 80 years. As a tribute to the last eight decades of love and style, Coast Diamond has partnered with BRIDES to give away a stunning Rose Gold and Diamond band! We encourage all brides-to-be to enter this wonderful contest that also includes fab prizes from OPI (love their nail polish! ), COVERGIRL, Burts Bees and Dove. 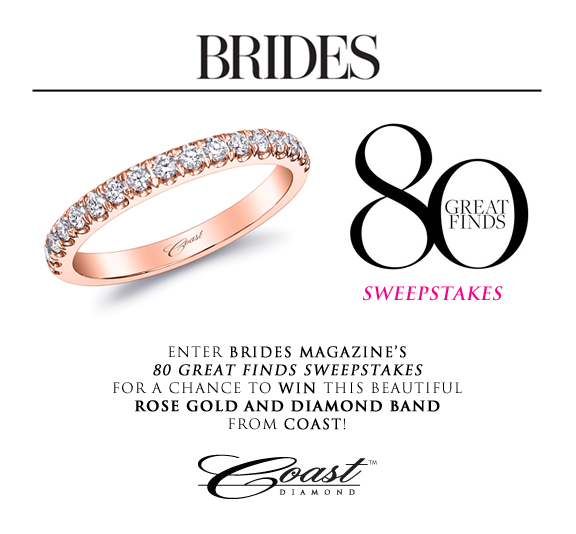 Enter the BRIDES “80 Great Finds Sweepstakes” for a chance to win a gorgeous a Coast Diamond rose gold and diamond band with an approximate retail value of $1,475! Simply visit the link below and click on “SWEEPS.” Then, click on “Learn More” underneath “80 Great Finds Sweepstakes” and enter your information! You have until midnight Eastern time on October 27th to enter. Good luck!! OPEN ONLY TO LEGAL RESIDENTS OF THE 50 UNITED STATES AND DISTRICT OF COLUMBIA WHO ARE AT LEAST 18 YEARS OLD AS OF THE DATE OF ENTRY. Promotion will begin at 12:01 AM ET on 09/02/2014 and end 11:59 PM ET 10/27/14. A note to the winner: Coast Diamond will make the band in your size – please allow 6 weeks for delivery.